’S e frèam-obrach airson leasachadh Gàidhlig ann an Ùghdarras na Pàirce a th’ ann am Plana Gàidhlig againn, agus tha e ag aithneachadh cudromachd na Gàidhlig airson lìbhrigeadh na h-amais fad-ùineach aig a’ Phàirc. 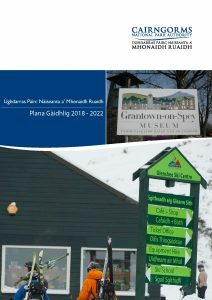 Tha Plana Gàidhlig 2018-2022 Ùghdarras Pàirc Nàiseanta a’ Mhonaidh Ruaidh ri làimh an-seo anns a’ Ghàidhlig agus anns a’ Bheurla, an lùib nan aithisgean-adhartais bhliadhnail againn. Our Gaelic Language Plan will act as a framework for developing Gaelic within the Park Authority and recognises the importance of Gaelic in supporting the delivery of the Cairngorms National Park’s long term outcomes. The CNPA Gaelic Language Plan 2018-2022 is available in both English and Gaelic, along with annual progress reports.